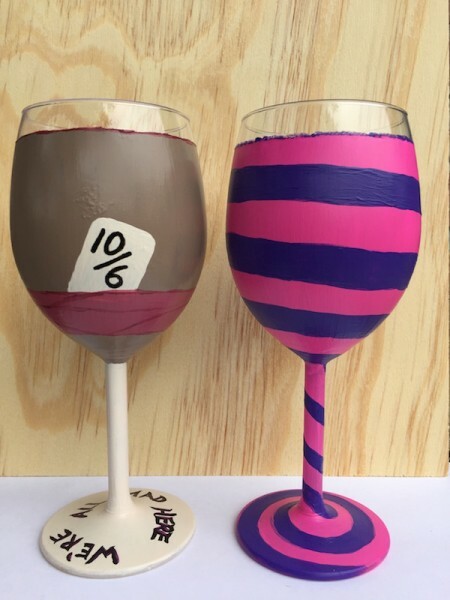 Mad Hatter and Cheshire Cat wine glasses with unique interior and exterior designs. The Mad Hatter's hat on the exterior and tea pots and tea cups on the interior. The Cheshire Cat's stripes swirl from top to bottom on the exterior and the infamous smiling face and tail on the interior. Sold as a set of two 10oz. glasses, these glasses are completely usable with all paint on the exterior of the glass. Handwashing is recommended.